At first glance, this scarf and I were not friends...in fact I was not a fan of it at all. But for some reason I couldn't stop looking at it or thinking about it. What I originally didn't like was that it was a flag...hello Fourth of July. I couldn't see past the fireworks. But then I started to notice the vintage feel of these stars and stripes. There was something about the antique white stripes mixed in and I could slowly start to imagine it having a home in my closet. It still felt American, but in a whole new way. A way that I could totally see it mixed in to my already boho wardrobe adding a unexpected twist. Why do we only wear American flag "things" on the Fourth of July anyway? 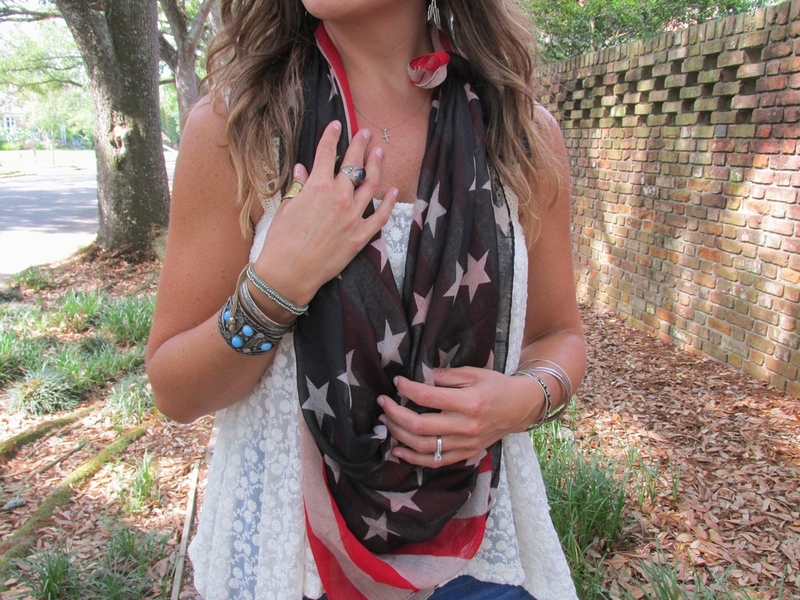 There is something really special about what our flag represents..so why not wear it all year long? Well that's what I'm going to start doing. I'm going to wear this scarf whenever I gosh darn feel like it whether people pledge allegiance to me or not. I mean this scarf mixed with a delicate fabric and a good mix of cuffs and bangles...yeah, I'd say I'm going to be sporting this accessory all summer long. Wardrobe favorites that is. Everybody has them. Pieces that are your go-to, buy five colors of staples. Items that get way more attention than the rest of your closet. I am guilty of playing favorites when it comes to fashion. And really no matter what the fashion trends are, these same items keep their spot as number one in the favorites department, I just change the way I wear them. 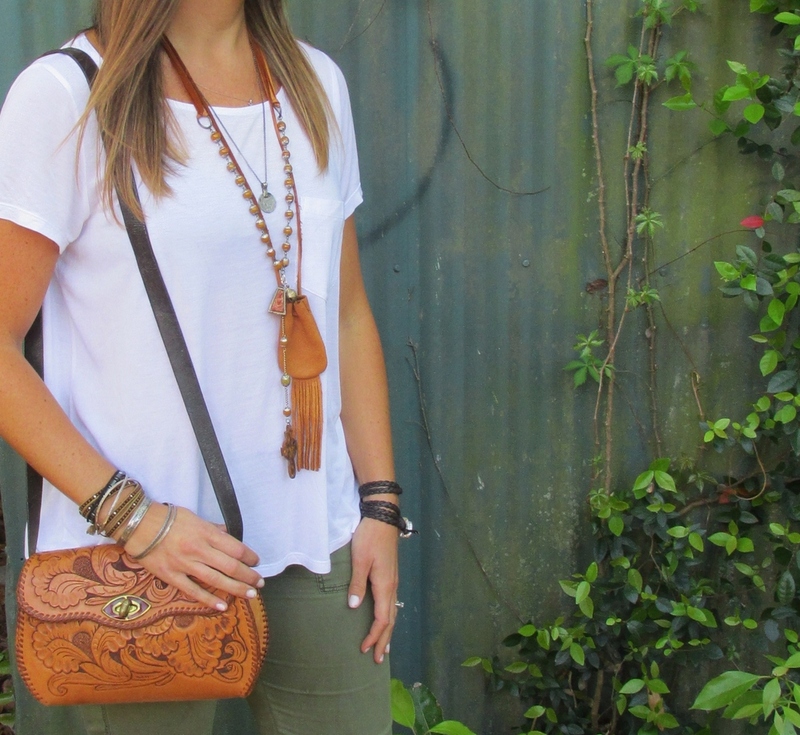 For me, I tend to collect white t-shirts, bohemian jewelry, cargos, booties, and leather bags. They can all work together, but they are also versatile and can be transformed from casual to dressy in a flash. They are easy. I like easy when it comes to fashion. Easy is good. Can we talk about why these tights are my new favorite wardrobe addition? They were an early Christmas present from my best friend. She saw them and knew that I had to have them and turns out she was right, because I basically want to wear them everyday. Look at those owls. Could they be any cuter? Let me back track for a moment so I can tell you where my love of owls came from. My Mom-Mom collected owls and now my mom has quite a bit of her collection. I love them because I feel like it connects the three of us together. Over the years I have started my own owl collection in my house and in my wardrobe and these tights fit in just right. When I was in high school I bought a solid white leather pant/jacket outfit with silver studs on the shoulders and thought I was pretty cool. Now looking back, I am not sure that "cool" was the correct word to describe the outfit, I'm pretty sure it was closer to an Elvis impersonator outfit, ha. If you had asked my best friend, she would have thought it was pretty rad, but that is only because she had a solid teal leather outfit...who did we think we were at 17? Sometimes I need to remember to be that fearless 17 year old who simply loved fashion. Bottom line...I was going to wear what I wanted to wear because it made me feel good.